Bio: A gentle intellectual, he is usually a quiet commander, but when the Destrons start attacking, he becomes a warrior whose bravery is second to none. Well versed in various martial arts, he is willing to lay down his life to defend against destruction and invasion. Debuting in 1988's Super God Masterforce, Ginrai was a human character who bonded with a transtector (a lifeless Transformer body) that looked like Convoy/Optimus Prime through the Godmaster process. This was Japan's take on that year's Powermaster concept, whereby small pilot figures transformed into the robots' engines to power them up and unlock their transformation abilities. Its a different and refreshing take on the concept and the show was the best of the three Japan exclusive cartoon series that aired in the late '80s. 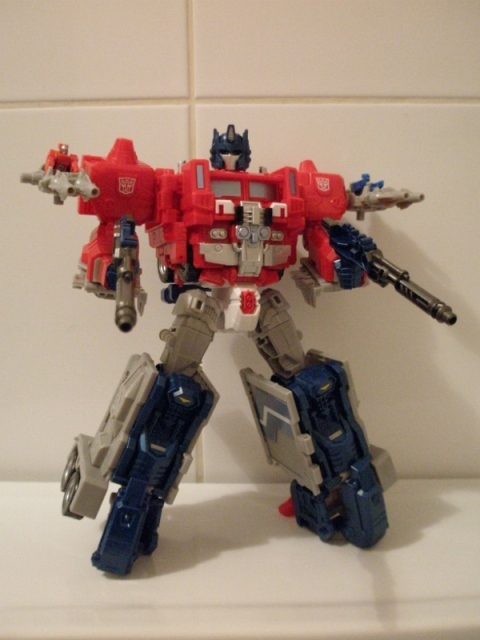 The original Super Ginrai toy was redressing of the Powermaster Prime mould, which added some diecast and retractable fists and a much nicer finish to that toy. In much the same way, this new Legends toy does the same � taking an already decent mould and sprucing it up a little and improving on the some areas with new tooling that Hasbro likely skipped to keep costs down. 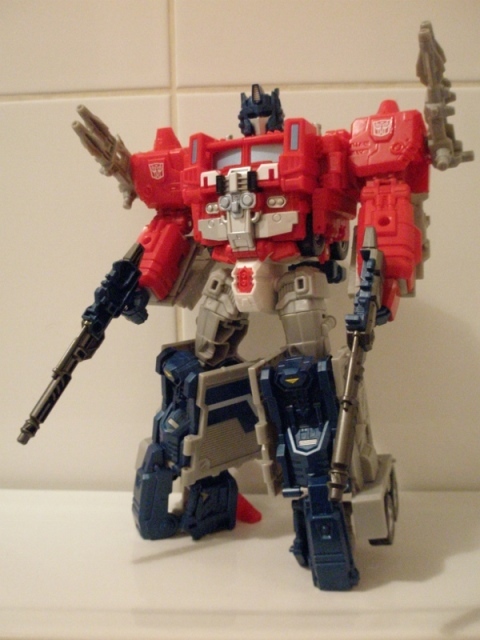 I've always been a fan of the Powermaster look for Optimus, but always been drawn to the Japanese Ginrai figure for the reasons mentioned above. Takara often turn fans heads for their better finishing on mainline Transformers products and for the Generations stuff in particular, but whilst in the past I've not been interested in the chromed parts and cartoon colours on their versions, Super Ginrai certainly had me sold. 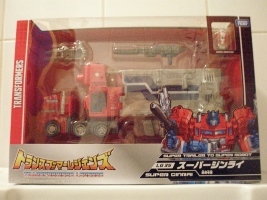 One thing I do like about the Takara releases, is that they continue to package the Transformers in their vehicular modes. It makes a nice contrast to the Hasbro releases, but I have to say, inclusion of some manga story pages aside, I do prefer the current striking western packaging design over Takara's current efforts, despite not being a huge fan of Hasbro's current character art outside of the small Legends figures. The super robot mode takes a lot of the 'problems' of the original toy (and even the Titans Return Powermaster Prime) and addresses them very neatly indeed. The big ones of having more proportionate arms and head is a big win straight off the bat. 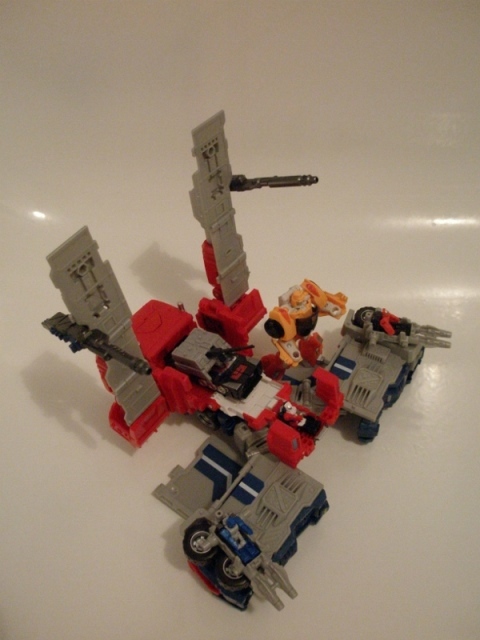 Super Ginrai also beats The TR Prime toy by having hands that are separate to the trailer roof sections, giving him wrists and improving on having the roof halves fold up under his forearms. The detailing is good, with some nice sculpting overall but especially on the elbow joints. The faux Godmaster block on the chest is also a very nice touch. The legs are also good and Takara have seen fit to replace the clompers used on the mould for Combiner Wars Ultra Magnus/Titans Return Powermaster Prime by bobbing on a set of hooves that look more like the original toy's feet. However, these new feet assemblies aren't that hot and whilst he is more than adequately pose-able, its difficult to manipulate his legs and stand him without inducing a Delbo-pose where it looks like the top half of the body is going to fall off. He does look pretty cool just standing about though, so that helps. The weapons are neat too � the shoulder cannons are great and I like the obvious spaces for Titan Masters to sit in. The two larger rifles are also good, with some nice design work and a gunmetal grey colour on the go. These can also be plugged together to accommodate a Titan Master. Ginrai himself is a pretty neat little fellow. Cast in white and black, with red arms and an Optimus face on his back. The detail on these tiny Titans is impressive � moreso here where some careful paint applications help pick out some key features � in this case the face and legs. What I like most about Ginrai is that he's very clearly a human in an armoured suit, and a lot less robotic looking than most of the other Titans. Mostly that impression comes from the shape of the arms and torso, which are a lot less blocky than some of the other Titan Masters I own. The tractor trailer alt mode is pretty neat. The big problem with it is that it looks a bit too cute to pass itself off as something you could see as a real vehicle. The huge, chunky wheels and odd proportions coupled with the cheery bright plastics make this look incredibly Playskool. Therein lies its charm though, as it really makes you want to play with it and tootle it around. The cab has a good range of movement, so turning isn't a problem and if it weren't screwed into place, this could detach and run around on its own. 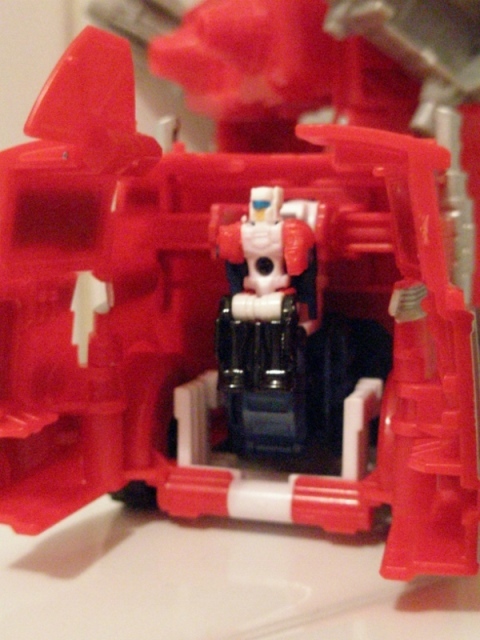 Inside the cab is seating for one Titan Master � you could probably have got two in, were it not for the necessity of this having to double up for the neck/helmet assembly of the robot mode. 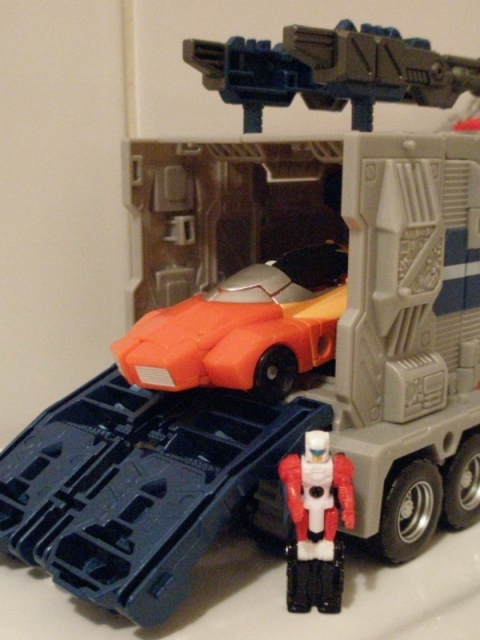 I do like how you open this up to sit Ginrai in too � the front halves of the truck open up like a wardrobe to pop him in. The trailer itself is a bit of a hollow nothing. 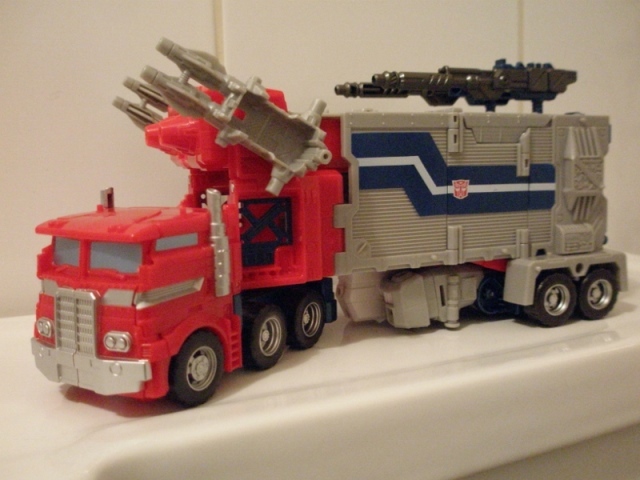 Not much of a big deal � you can see why the front of the trailer is all open scaffold and arm chunks from having transformed him � but it is a shame he can't comfortably accommodate any fellow Transformers in the back. It's a little too tight for Deluxes, and Legends just sort of have to put up with contending with a jumble of robot parts. The base mode is a bit of a pass for me. With the tractor cab still poking out at the rear, this looks more like a partial assembly for a funfair ride than a military station. The front of this with a control seat and the two manned cannons is good, but then you've got these great flat planks of trailer panels trying to pass themselves off as some kind of towers or something. They don't look very convincing and frequently wibble about. It's a shame they can't be compressed to half their height, which would improve things somewhat. It leaves this looking a bit lackluster and is easy to pass over as a legit third mode.